Trustpilot’s free Magento plugin allows you to automate your review collection for service and product reviews. You can also add multiple TrustBox widgets using the plugin and invite past customers to write reviews. 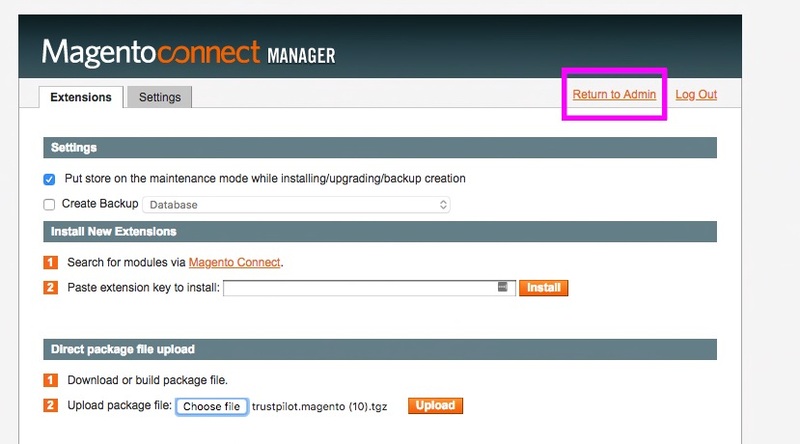 Learn how to download, install, and configure the plugin in your web store. Note: This plugin is for companies who use the Magento eCommerce platform. Not you? Go to our other integrations. Keep in mind that if you use other automatic invitation methods, you'll have to disable them to avoid sending duplicate invitations to customers. Here's the information regarding the Magento 1 plugin. Click here if you are using Magento 2. The Magento 1.x plugin supports multi-stores in versions: 1.6, 1.7, 1.8, and 1.9. Download the Magento 1.x plugin to your computer. Go to Trustpilot Business > Integrations > Ecommerce Integrations > Magento 1.x, and click on the Connect now button. Next, click the Download button. Go to System > Magento Connect > Magento Connect Manager and log in. Click on Choose file and select the plugin file you just downloaded, then click the Upload button. Click on the Return to Admin link on the top of the page. 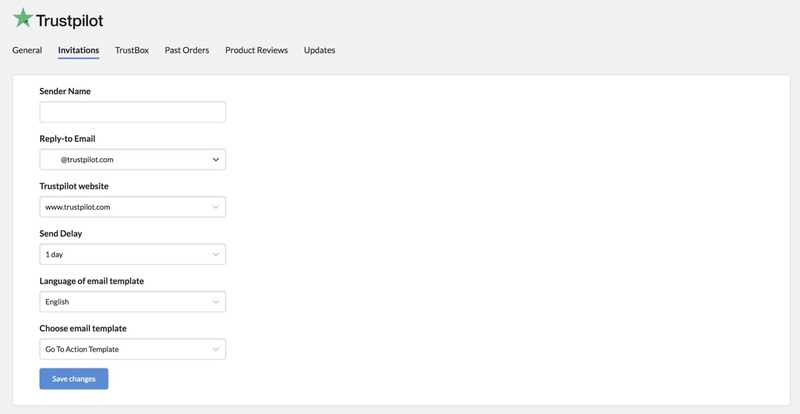 Once you return to the Admin Panel, you'll see the Trustpilot tab. You may have to use your Trustpilot Business credentials to log in. Sender Name: The sender information that appears in your customer's inbox when they receive your review request. Note: Currently, the Sender Email is the noreply.invitations Trustpilot email address by default. Send Delay: An order from your Magento web store automatically triggers an email to your customer - set the number of days you'd like us to wait before the email is actually sent. The maximum delay is 90 days. Configure what triggers the invitations to be sent to your customers on the General tab. Choose Order confirmed if you'd like to invite your customers when Magento is Processing your order. Choose Order completed if you'd like to invite customers when the order is Complete. Click the Save changes button to finalize the configuration. The Magento plugin allows you to send product review invitations if you use Trustpilot's product reviews feature. Once you've enabled product reviews, configure your product SKU, GTIN and MPN fields in Magento to let Trustpilot know where you are saving this information on your Magento platform. Click the Save changes button when you're done setting up the configuration. The Trustpilot plugin allows you to invite customers from the past 7 days to 3 months. 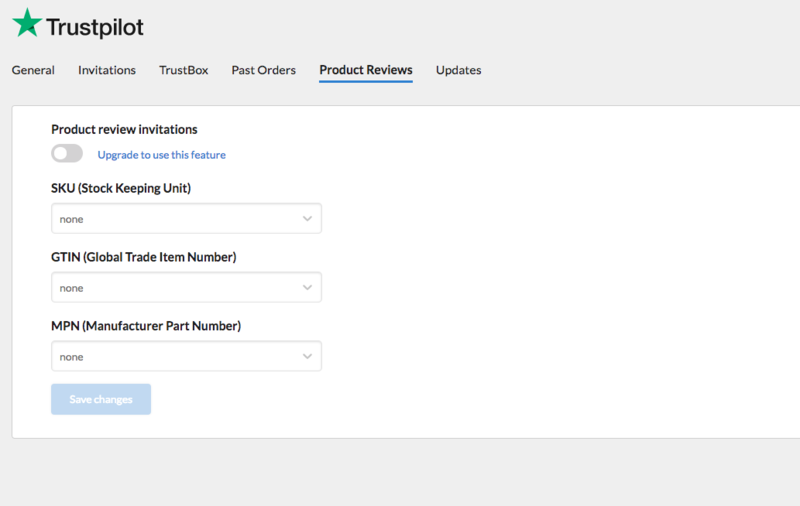 Select the period you want and click on Sync up orders. Now your past orders will sync up with Trustpilot's invitation system. 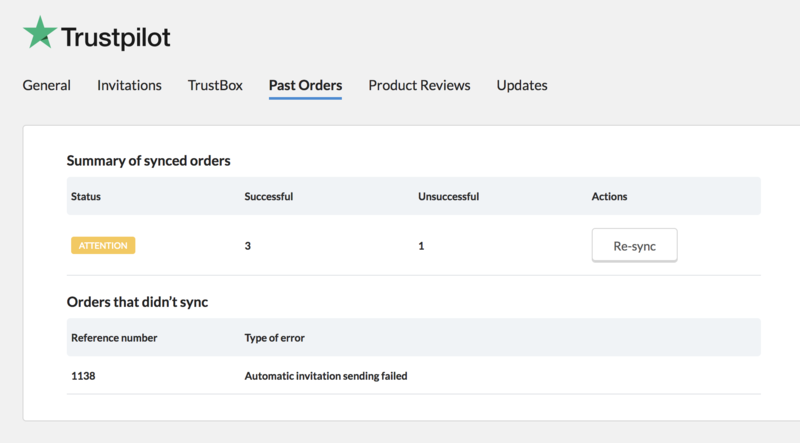 Next, you'll see a summary of your synced orders, so you'll know which ones synced up successfully with Trustpilot and which ones failed. At the bottom of the page, you'll see a list of failed orders with more details. To attempt to sync up the failed orders again, click the Re-sync button. You can add multiple TrustBox widgets to your web pages using your Magento plugin. To preview a TrustBox, go to your Magento Admin page and click the TrustBox tab in the top menu. Keep in mind that we currently don't have a sandbox environment available for testing purposes.